Lisa Ann Boudrot, 57, of Newport News, formerly of West Dennis, Massachusetts, passed away peacefully at her home January 14, 2019 after an extended illness. She was born at Portsmouth Naval Hospital to Peter J. Boudrot and Shirley Ann (Evans) Boudrot. After graduating from Dennis-Yarmouth High School on Cape Cod, she earned an undergraduate degree in psychology from Worcester State College in Massachusetts. As her illness progressed, Lisa changed her focus from work to family and friends. Invariably, she brought a smile and sense of optimism to people who met her. Lisa is survived by her husband, Matt Goss of Newport News and her brother, Michael Boudrot of East Falmouth, MA She was predeceased by her mother, Shirley, father, Peter and sister, Karen (Boudrot) Mantovani. The family will receive friends on Saturday, January 19, 2019 from 3:00-4:00 PM at Weymouth Funeral Home in Newport News. 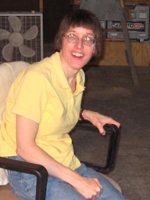 In lieu of flowers, please consider a donation in her name to the National Ataxia Foundation https://ataxia.org/. Arrangements by Weymouth Funeral Home.